The Pride Maxima heavy duty 3 wheel scooter brings outstanding performance and elegant styling together with rugged construction for an increased weight capacity of 400 lbs. 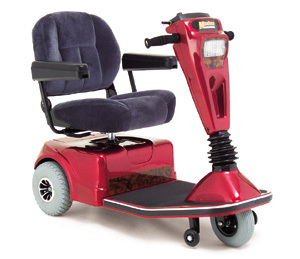 With a list of standard features like an easily adjustable tiller, front headlight, contoured medium back seat, durable one-piece frame construction, front anti-tip wheels and whisper-quiet drive train, the Maxima provides heavy-duty brawn with all the convenience and comfort of a luxury scooter. Maximum speed of 5.75 mph. Front recessed headlight standard, full directional light kit optional. Flat free, foam filled rubber tires.